More evidence that Twitter is hitting the mainstream - Coldplay have joined. Twitter has been getting a lot of news coverage in 2009. Hans Kullin has written a great review of how journalists used Twitter after the Hudson River plane crash yesterday (including how a Twitpic (Twitter picture) led news reports.) 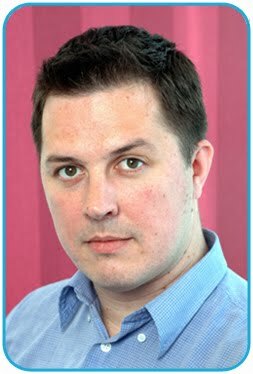 I wrote about Twitter coverage in UK newspapers and Rick Lamb argues that Twitter could be the new MySpace. 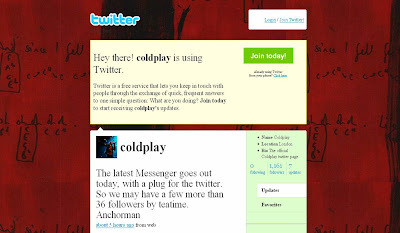 Coldplay joining (and promoting their presence) could see Twitter usage increase yet further. If it's good enough for Barack Obama, Stephen Fry and MC Hammer , then it's good enough for us. Yes, we've joined the twitter revolution by setting up the official Coldplay twitter feed at www.twitter.com/coldplay. Pop over there to read little Coldplay updates at regular intervals (which, for those unfamiliar with it, is essentially what twitter is for). " However, whilst Coldplay have been one of the most forward thinking users of digital in the music industry, they may be missing the point a bit with their Twitter usage. The attraction of MC Hammer and Stephen Fry is that it is actually them using Twitter to record their thoughts and actions. The Coldplay Twitter is not being used by Chris Martin et al, it is being used by a PR person to give updates on the band and latest news. Coldplay Twitter use may evolve into something more interesting, but at least they are there and being so will further drive Twitter uptake across the board. Russell Brand and a number of other UK celebs rush to join Twitter! Good post and I would have to say agree with you on twitter going mainstream. I think nearly everybody has heard of it this stage even if they don't know how to use it! While Twitter's growth is remarkable, I would hesitate to suggest that they have gone mainstream. The Mar Comm world is becoming increasingly Twitter savy. Brittney is on Twitter! Shaq is on Twitter! My mom is on Twitter! But none of them are truly engaging in real conversations. None of them are really personally using the platform. The mass media loves to proclaim twitter as the next big thing. But in my experience, most Twitter adopters are not yet finding sufficient value in their first few visits to make this a truly mainstream ready dynamic. Most users still require a walking guide to show them around. This is the difference between Facebook and Second Life. This is the difference between true mainstream appeal and noise in a fishbowl. Marketers will continue to explore the dynamic. And as more marketers adopt the platform, it will become louder, and possible somewhat less meaningful. But if Second Life taught us anything, it's that Marketer adoption does not equal mainstream adoption. Now I'm inspired, feel like I need to go write a post. Thanks! @kullin I didn't know that interview was live yet - thanks for the link! @jonburg I agree that Britney / Coldplay / etc (delete as applicable's) PR team using Twitter to post short updates is not really getting it. However, two UK examples @stephenfry and @wossy are dragging Twitter into the mainstream here. Comedian Stephen Fry is using Twitter personally, engaging in conversations with his (31000) followers and even using Twitpic regularly. @wossy is even more interesting. Jonathan Ross / @wossy is a bit like the Letterman / Jay Leno of the UK. He is the highest paid BBC star, but is currently serving a 3 month suspension after a joke was deemed to be in poor taste. Jonathan Ross returns to the BBC shortly. Stephen Fry will be the first guest on his chat show and he intends to discuss Twitter with him. Jonathan Ross is also taking requests on Twitter for his first radio show after his suspension. The point about having to 'learn Twitter' is also valid - but the actions of celebrities are useful. for example @wossy explained at length about his Twitter learning curve and how it took him a long time to learn how to use @ to reply to someone! @coldplay (and accounts like this) do not in themselves take Twitter mainstream, but when coupled with all the other UK activity, the press coverage and the ever growing number of users - Twitter really could be the story of the year!